KoopaTV: Nintendo and Post Consumer Brands: Celiac Discrimination! Here are all of the participating cereals (according to the Rules) and their main ingredients. Thankfully, not every single possible SKU (stock keeping unit, aka a unique variation) is represented, since Malt-O-Meal has over 30 of those. Red means it is not gluten-free, gold means it could be gluten-free depending on how it's processed that day, and green means it looks safe from the ingredients. 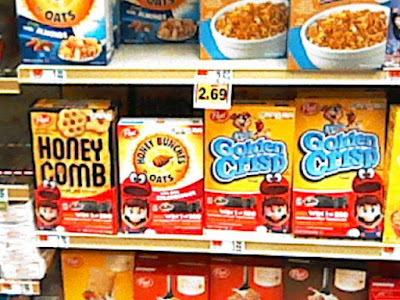 Contrary to the name, Malt-O-Meal cold cereals aren't made of malt (barley, which has gluten), so some of them are safe for Celiacs to eat. All of the normal Post stuff I would stay away from. In case you aren't aware, Post bought out Malt-O-Meal back in 2015, so that's why they are treated pretty differently than the rest of Post's stuff. I have no idea if any of the cereal is worth eating, but Malt-O-Meal advertises that you can get a refund on their cereal if you don't like it, with refunds being valid for only one item per flavour per household. You could take the promotional code and then get refunded for it! Meanwhile, there is “Super Mario Cereal” now launching, brought to you by Kellogg's, described as “star shaped cereal with Super Mario inspired marshmallows.” That's made of whole grain oat flour, sugar, yellow corn flour, rice flour, oat fiber, gelatin, and wheat flour. That's a lot of flour types, and that wheat flour at the end ruins it. Amazingly, the box doubles as an amiibo, making Super Mario Cereal the cheapest amiibo to acquire, unless you count the 6-pack of amiibo cards for $6 you can get for Animal Crossing. 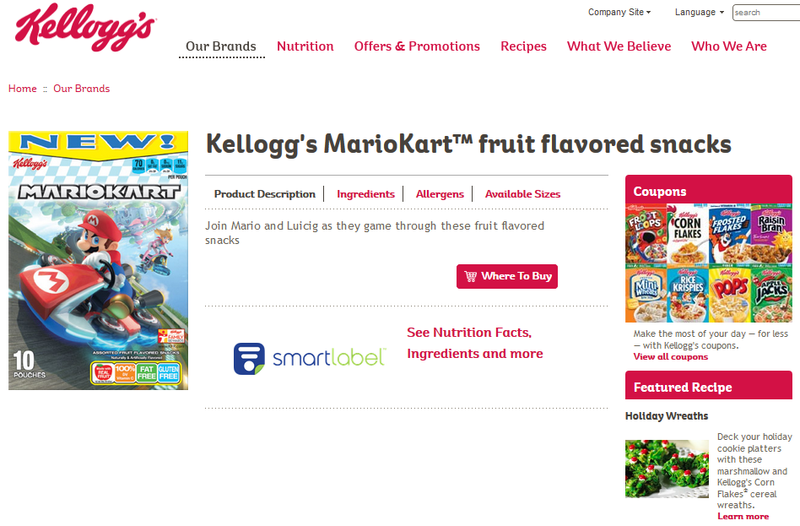 “Kellogg's MarioKart fruit flavored snacks” are gluten-free and fat-free, so I can eat them. No special prize associated with them, but they might taste good. I'm just worried about who Luicig is supposed to be. Sounds like a horrible mash-up of myself and Luigi. Do I really want to join a half-Ludwig? That sounds... dangerous. KoopaTV reminded ourselves to remind you about the free alternate mode of entry for the contest. "Shouldn't people with Celiac Disease be able to share in getting free Nintendo Switch products?" You said yourself that those Alternative Method Entries even being valid requires some BIG assumptions (your caps) and I think it'd be much safer to assume that NONE of the winning times are actually in that window. Or at the very least not more than 2 or 3. Hey, according to the rules, the predetermined winning times are random. The amiibo cereal also has gelatin which usually comes from pigs and therefore is discriminating against those who keep kosher or halal. I personally keep kosher and at the Nintendo NY event where you can get autographs by the Zelda manga authors I was in the same line with two Muslim women in burkas so there are religious Muslims who play video games too. Have you considered writing a letter to Post about the contest and being gluten-free? I am sure PR would try to make an inspiring story out of it, to pretend that they care. I didn't consider it, because I don't care. I eat General Mills. Ain't ever eaten Post in my life, actually. In the form of "potato kugel". I'll probably grab a box just to see the what the functionality is. I'm pretty sure the fruit snacks have been out for a while now, however. I've seen plumber fruit snacks in stores, but inspired by NSMB Wii, not Kart.